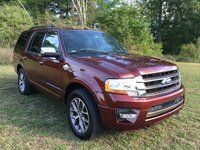 Looking for a Used Navigator in your area? 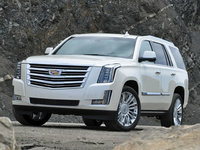 CarGurus has 5,992 nationwide Navigator listings starting at $1,890. Despite a nip here and a tuck there, the 2015 Lincoln Navigator at first glance still looks like it did 7 years ago. On closer inspection, a few tweaks to the hood, grille and front fascia will be noticed, as will a new taillight design and a reworked tailgate. Lincoln Drive Control with a trio of driver-selectable cruising modes, Normal, Sport and Comfort, is also expected to be available for the upcoming Navigator, while upgraded suspension damping technology is slated to become standard throughout the lineup. No doubt, however, the biggest news for Navigator fans and wannabe-fans is a new EcoBoost V6 engine that replaces the undeniably potent but gas-guzzling V8 of previous Navigator iterations. Getting back to basics, this 8-passenger full-size luxury sport ute will again come in a pair of trims, the base Navigator and the stretched-out Navigator L. The base version returns at 208.4 inches long (17.4 feet) and riding on a 119-inch (9.9-foot) wheelbase, while the L expands to 223.4 inches (18.6 feet) of overall length on top of a 131-inch (11-foot) wheelbase. Cargo capacity in standard-length editions is 103.3 cubic feet with all rear seatbacks folded, while the L can fit up to 128.2 cubic feet of stuff, again with the rear seatbacks folded. Of course, both Navigator variants are delivered with standard rear-wheel drive (RWD), while weather-busting and terrain-taming part-time 4-wheel drive (4WD) will remain available for each. As for that new powerplant mentioned earlier, it’s the same 3.5-liter turbocharged EcoBoost V6 that has powered this princely ute’s F-150 cousins for some 3 and a half years now, which is sort of fitting since the Navigator is based on the F-150 platform. Anyhow, look for 380 hp and an impressive 460 lb-ft of torque from this turbo 6 as it retains the management services of a capable 6-speed shiftable automatic transmission. Meantime, Lincoln is prepared to assert that this new EcoBoost engine will back its allegedly prescient claims of best-in-class mileage with an 18-mpg average in RWD trims and 17 mpg in 4WD editions. Towing, meanwhile, is rated at 9,000 pounds with the optional tow package installed. Adorning the 2015 Navigator’s upgraded profile will be the traditional 20-inch alloy wheels, a roof rack, power-folding heated outside mirrors, power-retractable step running boards and power liftgate, while premium leather upholstery with upgraded stitching, heated power-adjustable front seats, a power-folding third-row seat, and power windows and door locks again grace the interior. Cruise control and tilt-wheel steering are again bolstered by power-adjustable pedals, while a rear-view camera remains complemented by front and rear parking sensors and a remote garage door opener. A newly redesigned instrument cluster and center stack, combined with an upgrade in the traditional chrome and leather cabin accent materials, gives the 2015 Navigator a pleasing posh that’s further refined by the return of driver's memory settings for seats, mirrors, tri-zone climate control and audio levels. Techno goodies include Bluetooth-interfaced Sync infotainment (improved for 2015) with an 8-inch display and subscription-based destination guidance, along with voice-activated navigation and a 600-watt THX premium audio system boasting 12 Surround Sound speakers, satellite radio, a memory-card slot, video monitor and USB ports front and rear. As mentioned, both the new Lincoln Drive Control and a new suspension damping system are added options for the 2015 Navigator stable, while the availability of a power moonroof and rear-seat DVD entertainment carry over from last year. Also newly available for 2015 are reworked 22-inch alloy wheels, while remote engine start, the popular Monochrome Appearance Package, second-row bucket seats (for 7-passenger capacity) and a cargo-management system (L only) are reprised from 2014. Finally, standard safety equipment includes the government mandated antilock braking (ABS), traction and stability control, side-mounted and 3-row head airbags of yore, along with standard front fog/driving lights, daytime running lights and turn-signal-integrated mirrors. Additionally, a post-collision safety system and remote antitheft alarm, again complemented by Ford/Lincoln’s touted MyKey programmable speed and audio limiting system, all return in the next-gen Navigator and remain bolstered by SOS post-collision alert technology. Whether the 2015 Navigator’s primping, pruning and re-powering will upset the folks at Land Rover and GM is anybody’s guess, but chances are not by much. In any case, we’ll find out in the late summer of 2014 when this big Lincoln is slated to begin gracing dealer showrooms. 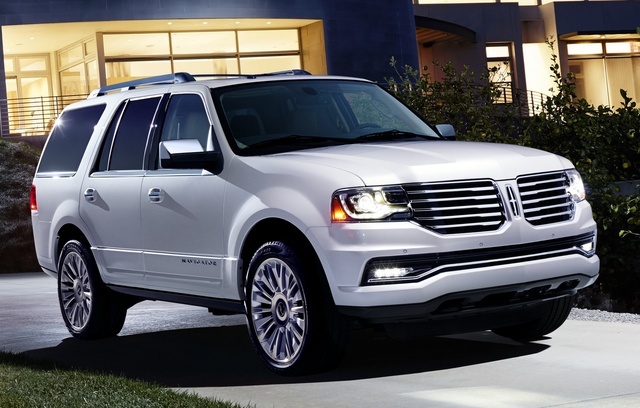 What's your take on the 2015 Lincoln Navigator? Users ranked 2015 Lincoln Navigator against other cars which they drove/owned. Each ranking was based on 9 categories. Here is the summary of top rankings. 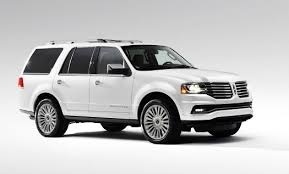 Have you driven a 2015 Lincoln Navigator? How Do You Turn Off All Interior And Exterior Lights In A 2015 Navigator? 2015 Navigator, key fob can't be detected. What are some solutions? 2015 Navigator L - AC will blow out of all vents but heat only blows out of defrost vents.